Let’s face it: interpreting your results isn’t exactly the most exciting part of marketing your business. You like seeing people opening your emails and value the increased traffic and new business that comes from using email marketing, but you really don’t have the time to get into the nitty gritty details. When we surveyed 1,200 small business owners and asked what obstacles keep them from using marketing data: 49 percent say they don’t know where to begin and 40 percent say they just don’t have the time. Using reporting and analytics to your advantage doesn’t need to be a full-time job. Getting familiar with your reports can actually help you save time, because you’ll know which marketing activities are working and which ones may not be worth your time. It will also give you the ability spot key trends, see who is responding to your messages (and who isn’t), and get inspiration for your future marketing ideas. In this post, you’ll learn how to interpret your email marketing results and make smarter decisions in less time. Let’s start by covering the basics. Tip: Familiarize yourself with these terms and use this glossary the next time you’re looking into your reports. Now that you have a better understanding of some of the key terms and how to find reports, let’s think about what these numbers are telling you and how to address some of your problem areas. My email open rate is not as high as I’d like? 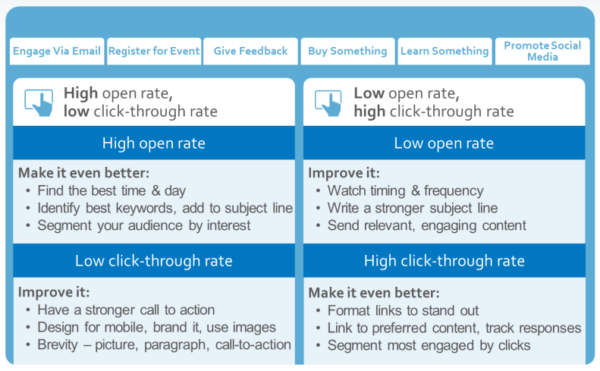 Open rates let you know how many of the people who receive your emails are actually taking the next step to open and read the content you send out. Your timing and frequency could be off: Sort your opens chronologically. Compare the average window of time people opened your email to the day/time you actually sent your email. Then send your next email at that time when your readers are telling you they are most likely to open email. We have a tool to help you find the best time to send. Consider also if you are sending too often or not sending consistently enough. It could be an issue with your subject line: Do you get to the point of the email in 4 to 7 words? Your subject line might be getting cut off or it might not stand out enough. You should also use tools like Google Analytics to identify keywords you’ve used in successful emails, blog posts, on social media, and in your website that draw your audience’s attention. Use them in your subject lines. Play around with funny subject lines or use questions — here are some ideas for strong subject lines. Rewrite your subject line and resend the email to those who did not open with a more powerful subject line. The email’s content might not match up with your audience’s interests: As you review your open rate and click rate, you’re learning about what content and keywords they respond to. Use tagging to create groups of contacts interested in different topics or based upon their ‘behavior’ with your emails so that you can then refine your marketing using more targeted techniques designed to speak to the right people about the right things. A good amount of people are opening my email, but no one seems to be clicking my links? If you’re seeing a lot of people opening your emails, you already have an audience that wants to engage with you. But if your links aren’t getting clicked, your content is not connecting with these people as well as it should. Over time, these contacts could become less engaged and less likely to open future emails. To avoid this problem, pay close attention to what type of content is grabbing your audience’s attention. Look back at your email results for any spikes in engagement, or see if there’s anything that’s been performing especially well on your social media channels. A strong call to action: Consider the wording in your call to action — is it clear? Is it telling people exactly the action they should take and do they get a sense of why it matters to them? It’s best to have a call to action near the top of your email so your readers don’t have to scroll too far down to get the main takeaway. Also use buttons to make your call to actions stand out. Clear and concise information: Using multimedia like images and video is a great way to boost engagement and cut down on the amount of text in your email. Use these best practices for sending highly visual emails. Mobile friendly design: Don’t forget about your subscribers who are reading your emails from a mobile device. Make it easy for them to engage with your content on a small screen by using a single column template and avoiding tiny fonts. Preview your emails on a mobile device before sending and use a mobile friendly email template. Try these seven things to significantly improve your click-through rate. What if my emails are bouncing, being marked as spam, or receiving too many opt-outs? Bounces: There are a few different reasons why emails bounce, but often the problem is out of date contact information. If you have another way of reaching a contact, ask them for their updated information the next chance you get. Removing email addresses with ongoing issues will help you maintain a good email open rate. Spam: Permission-based email marketing is the best way to avoid spam reports. Always ask your contacts before adding them to your mailing list. Be clear about what you will be sending and how often. Avoid these 6 mistakes that could get your email marked as spam. Opt-out: A few opt-outs from time-to-time are normal as your contacts’ interests change and your messages might not be as relevant as they once were. To make sure you’re on track, find out why your contacts are opting out. As you begin to bring reports and analytics into your strategy, one of the most important steps will be connecting your email analytics to your business results so you can see what’s working well and what can be improved. We created a simple worksheet to help! Use the tips we’ve outlined in this post and make sure to revisit the worksheet after your campaign goes out. What worked? What didn’t? How can you continue to improve your results? With this worksheet, you’ll be on your way to better email marketing results and more opportunities to grow your business with email marketing. Learn how to use these worksheets for your business! 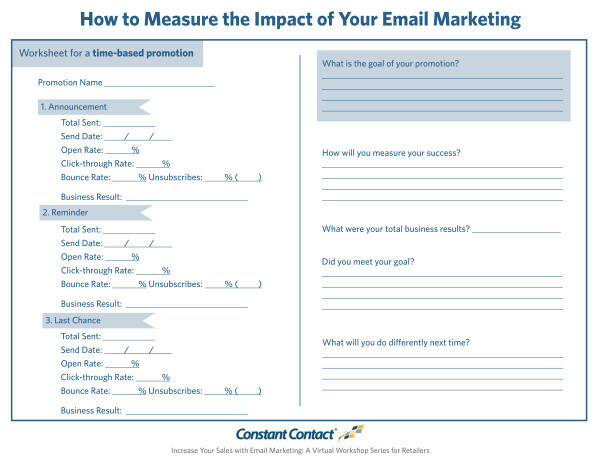 Watch our free workshop How to Measure the Impact of Your Email Marketing.